One of the many important woodland sites managed by the Wildlife Trust in this part of the country, is the always interesting Hayley Wood. I took a trip over there recently, with my camera in tow, to get a few shots of the interesting trees that it contains. Fire of London, and it still produces leaves. A large wood in this area of the parish was mentioned in the 1068 Domesday Book, but by 1251 it had been split into two: Hayley Wood and Littlehound Wood. Agriculture in the area declined after 1350 and the wooded area expanded, and by 1650, Hayley Wood covered 120 acres and Littlehound 40. Around 1655, Littlehound was 'new stubbed' and disappeared under cultivation, although its outline can still be seen in the form of field boundaries. 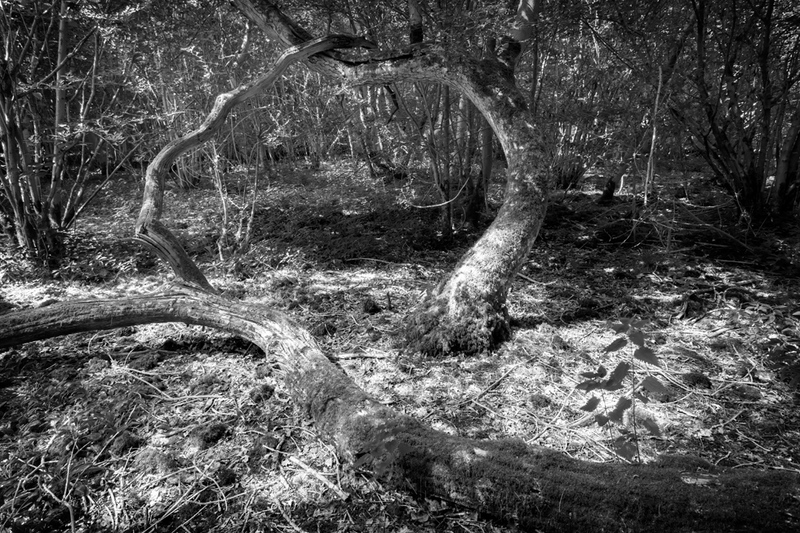 Hayley Wood however, was confiscated from the Bishop of Ely by Queen Elizabeth in 1579 and became privately owned. The woodland was bought in 1962 by the Cambridgeshire and Isle of Ely Naturalists' Trust, for preservation as an undamaged example of coppiced woodland. This natural sculpture is the remains of a fallen tree that has been weathered over many years. Coppicing is a traditional method of woodland management which takes advantage of the fact that many trees make new growth from the stump or roots if cut down. In a coppiced wood, which is called a copse, young tree stems are repeatedly cut down to near ground level. 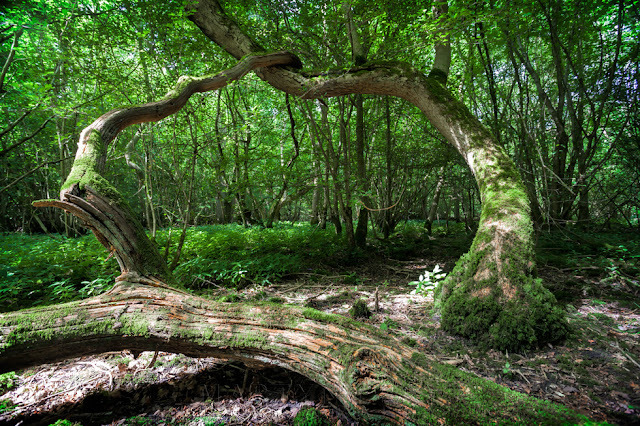 In subsequent growth years, many new shoots will emerge, and, after a number of years the coppiced tree, or stool, is ready to be harvested, and the cycle begins again. Pollarding is a similar process carried out at a higher level on the tree. Close up of a coppice stool covered in moss. 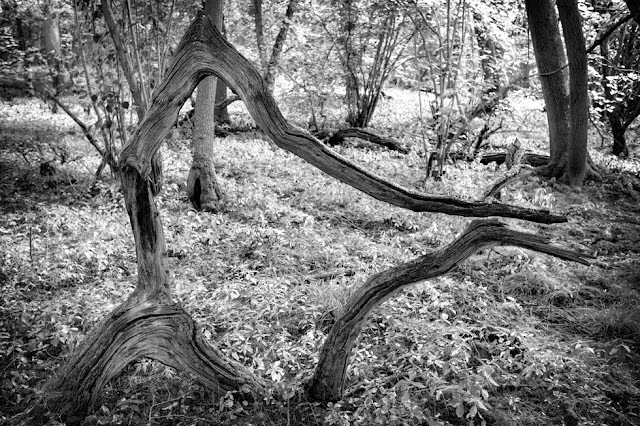 Coppicing maintains trees at a juvenile stage, and a regularly coppiced tree will never die of old age—some coppice stools may therefore reach immense ages. 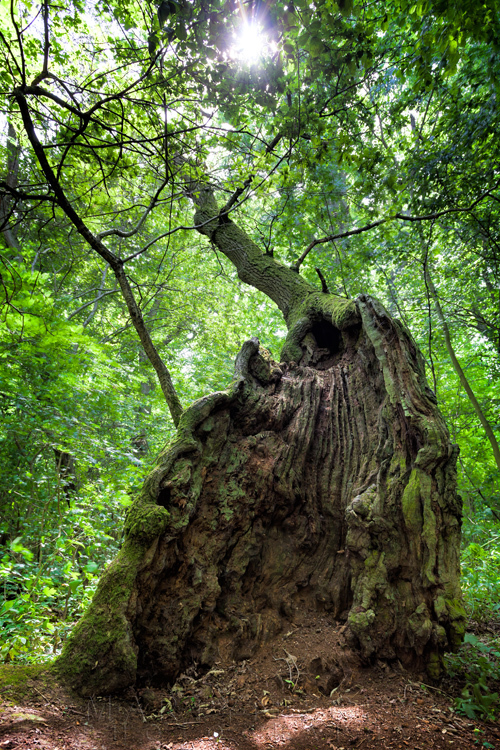 The age of a stool may be estimated from its diameter, and some are so large—perhaps as much as 18 ft across—that they are thought to have been continually coppiced for centuries. 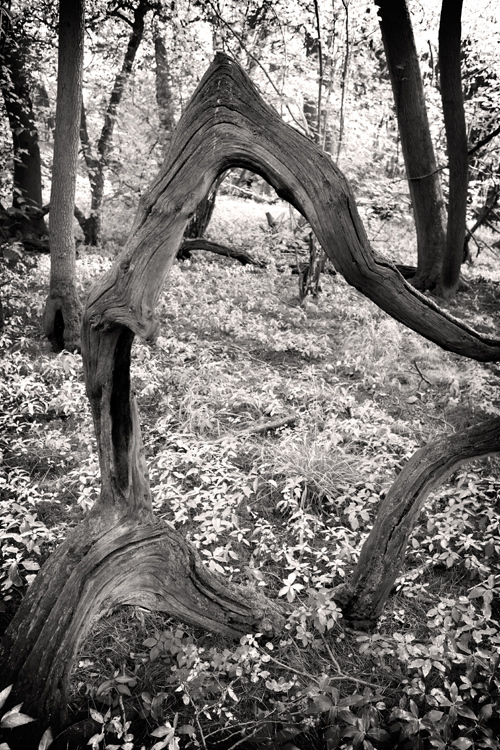 It is this coppicing that produces such unusual and bizarre tree formations. Unusually, the wood was fenced off in 1972, to protect the oxlip population from deer, as they love nothing better than to munch on the the buttery yellow flowers, and oxlip is a plant that only grows in a handful of places in the UK and is considered threatened. So it was well needed, and it has certainly done its job, as Hayley Wood now boasts one of the largest oxlip displays in the country. 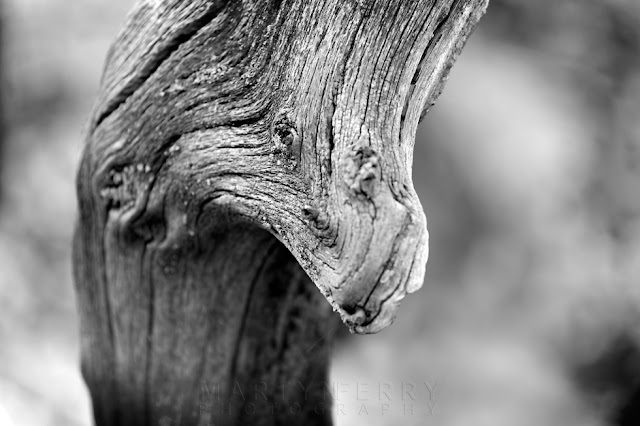 Close up of a section of a dead branch that seems to resemble the face of a lizard type creature. Unfortunately I was there at the wrong time of year to appreciate the creamy blonde florets that carpet the woodland floor in spring. But that was of no matter, as it was the trees I was there to see, in particular, the more eccentric examples that dot the nature reserve, and catch the eye. 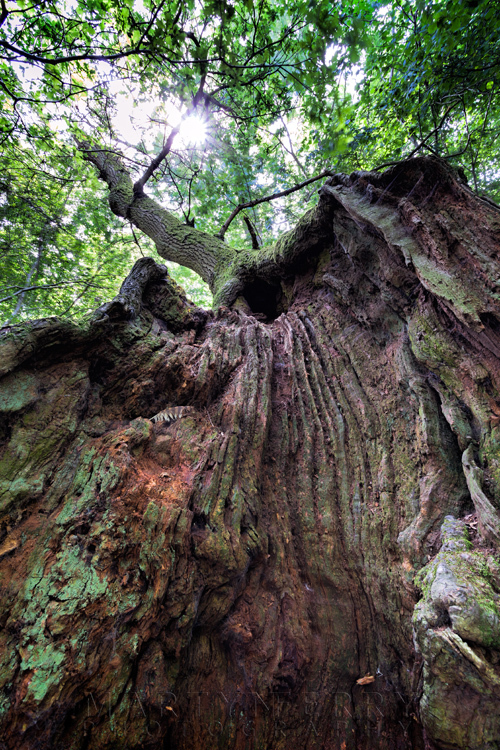 Looking up towards the woodland canopy, along the interior of the old oak tree. Another view of this natural work of art. 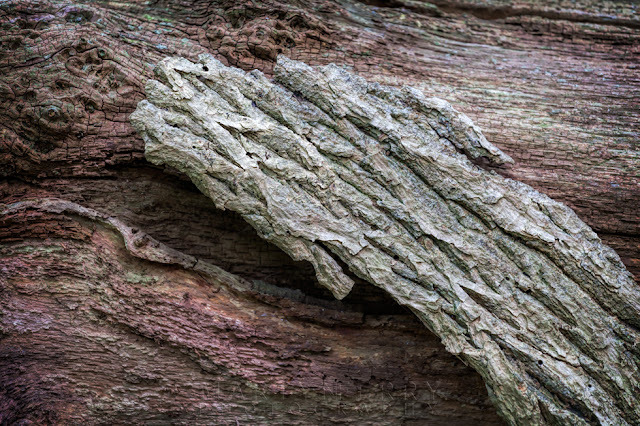 Remains of bark on an old tree. 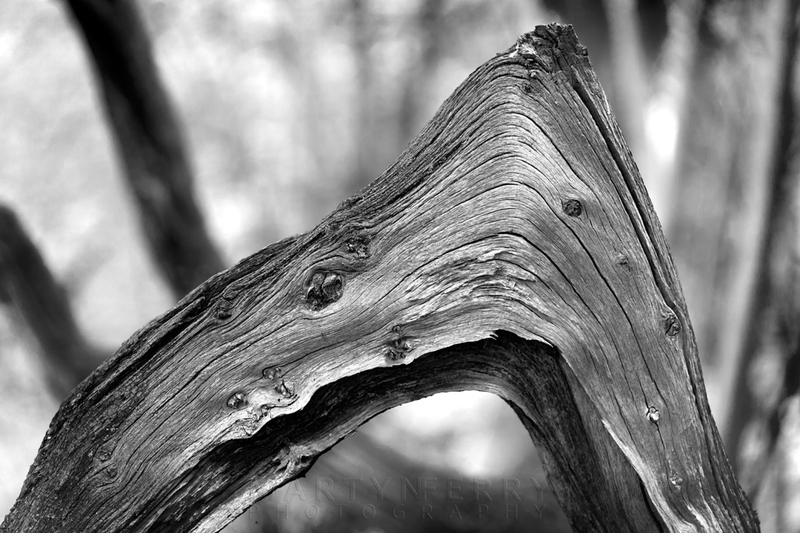 Interesting to see the line of the wood grain and how the branch managed to grow at right angles.